DOWNTOWN CLEVELAND, OH (WOIO) -An Ohio group is trying to change the way congressional districts are drawn in the Buckeye State. Cleveland is home to some of the first public housing projects in the nation. Outhwaite Homes, Cedar Apartments and Lakeview Terrace–all built in the late 1930s–were the first public housing projects to receive funding from the federal government’s newly-created Public Works Administration. This public housing was conceived as a way to help struggling, but upwardly mobile families out of slums and tenements. More than simply shelter, these “estates” included green space, murals and playgrounds designed to produce positive American values and strong children. Brothers Carl and Louis Stokes moved into Outhwaite Homes Estates with their mother in 1938. 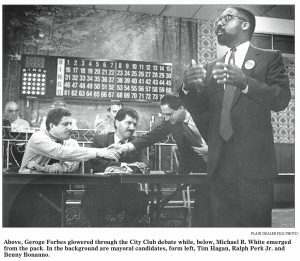 Carl became the first African-American mayor of a major U.S. city when he was elected mayor of Cleveland in 1967. Louis was the first black congressman elected in the state of Ohio, and served 15 terms in the U.S. House of Representatives. Both Carl and Louis credited moving to Outhwaite as a key to their eventual success. Both advocated for public housing and worked to improve its effectiveness throughout their political careers. 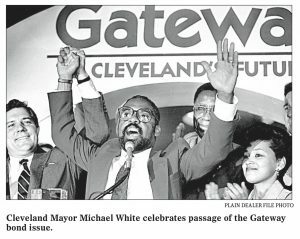 As part of our ongoing Living History series, which looks to Cleveland’s past to inform its future, ideastream hosted a community conversation on the history of the Outhwaite Homes and public housing in Cleveland, on the Stokes brothers’ public housing advocacy, and a look at where public housing stands today. Presented in partnership with Cuyahoga Community College’s project “Stokes: Honoring the Past, Inspiring the Future,” a yearlong, community-wide commemoration of the 50th anniversary of Carl Stokes’ election as mayor of Cleveland, and a celebration of Carl and Louis Stokes’ lasting contributions to Cleveland and the nation.